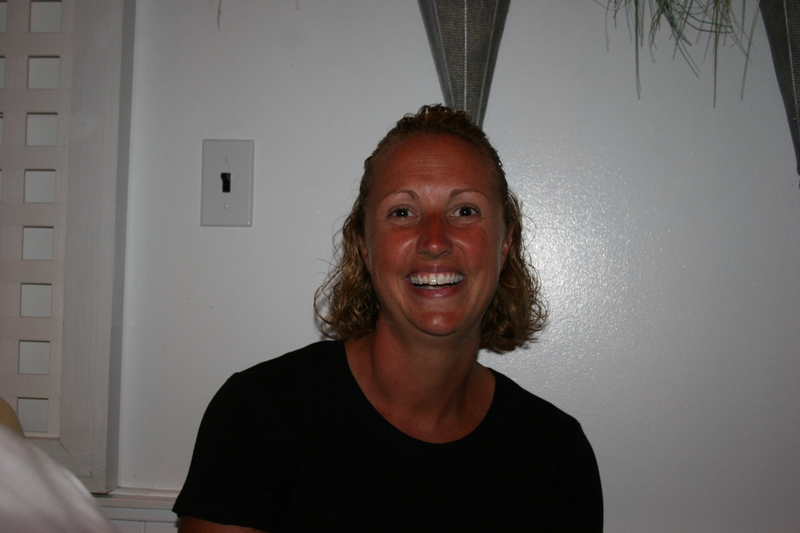 Our vacation week in Avalon began with 7:00 P.M. reservations at the Black Duck on Sunset in Cape May for my wife, Kathy, and myself along with four other couples who were spending the night at our “house for the week”. All of us were looking forward to a good meal and although we arrived on time we had to wait outside for about 20 minutes as our table for ten was occupied by a group that was reluctant to leave. Eventually, our patience was rewarded and we were seated in the back room with the women at one end and the men at the other. Our server, Jessie, read off the list of the evening specials and it was apparent from some of the ooohs’ and ahhhs’ that a few folks had heard something that would influence their choices. There really was quite a diverse selection and our appetizer picks emphasized the many different items available. I must confess that a week after the dinner my mind is fuzzy as to exactly who ordered what but I know several items. We had quite a few wines available. The 2003 Chateau St. Jean , Cinq Cepages, a Cabernet blend from Sonoma County. This one is smooth and creamy with lots of black cherry and chocolate and, at $29.99 as a Chairman’s Selection awhile back, a true bargain from its normal $60.00 price tag. Joe B. brought with him something he had purchased a few years ago on a trip to Italy, the 2000 Contucci, Vino Nobili di Montepulciano, Riserva. 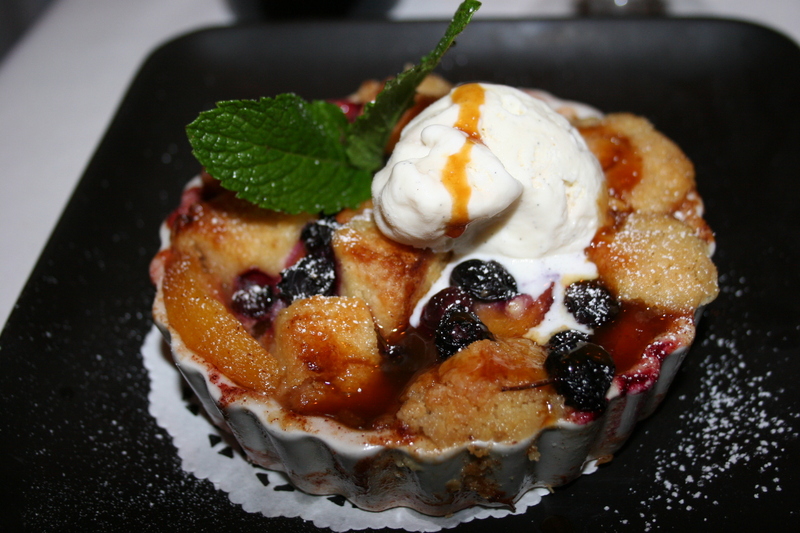 Dark plum fruit and a smooth, round mouthfeel added enjoyment to the food. Gerry’s 2006 Epiphany, Petite Syrah, Santa Barbara County, showed dark cherry, cinnamon and cedar and would have been perfect with any red meat. 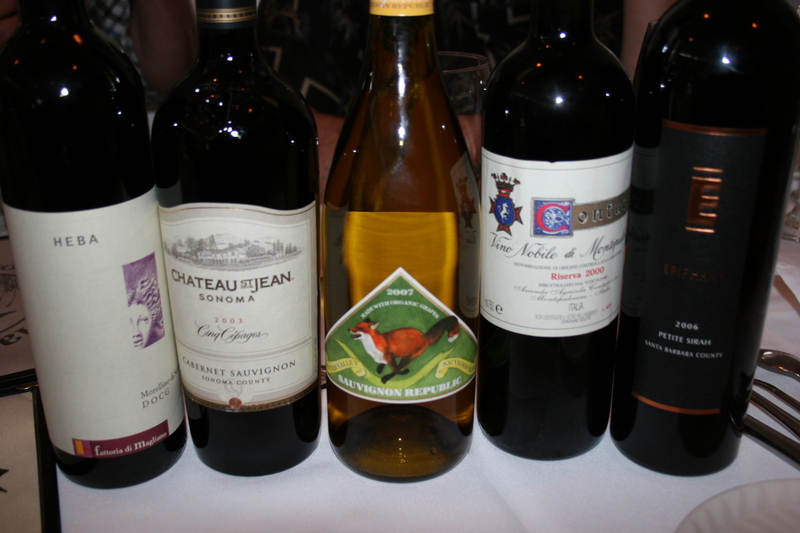 Although I didn’t taste them we also had a 2007 Sauvignon Republic, Sauvignon Blanc, Potter County, CA and a 2006 Fattoria di Magliano, Morellino di Scansano, Heba, a Sangiovese-based Tuscan wine. I believe I also spotted a 2008 Artesa, Chardonnay at the ladies table that was perfect for the fish dishes offered. 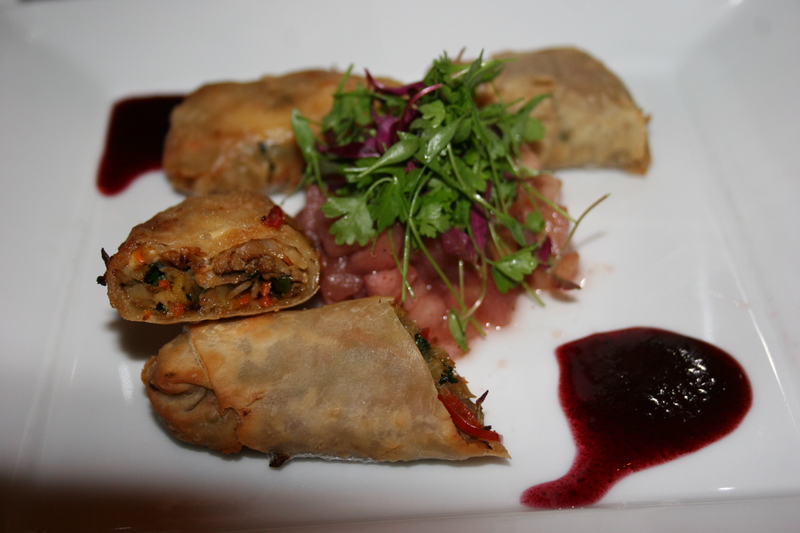 With a ton of mouth-watering choices to choose from I picked the Duck Confit eggrolls with a fruit salsa and blackberry sauce for dipping. It was a good choice and a fine beginning to the meal. 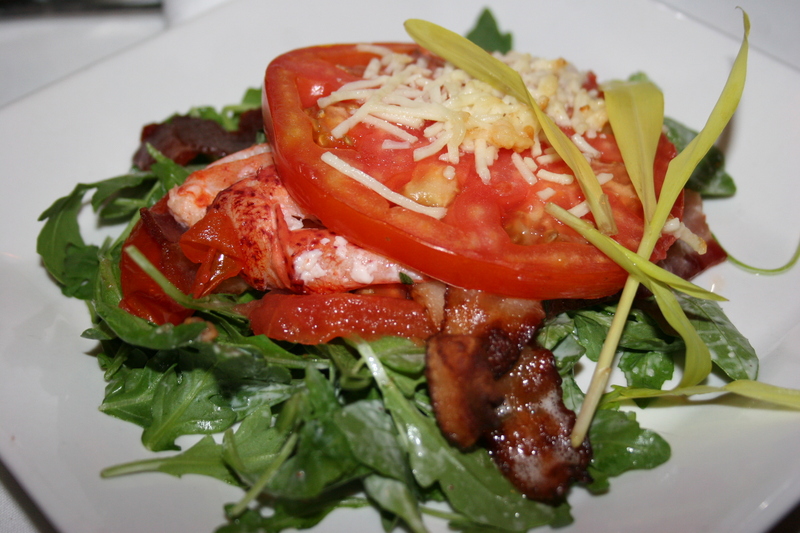 One of the “special” appetizers that caught a lot of people’s eyes and ears was the “BLT”; bacon, lobster and tomato with an arugula salad tossed with Caesar dressing. I heard no complaints from any of those who selected this unusual offering. 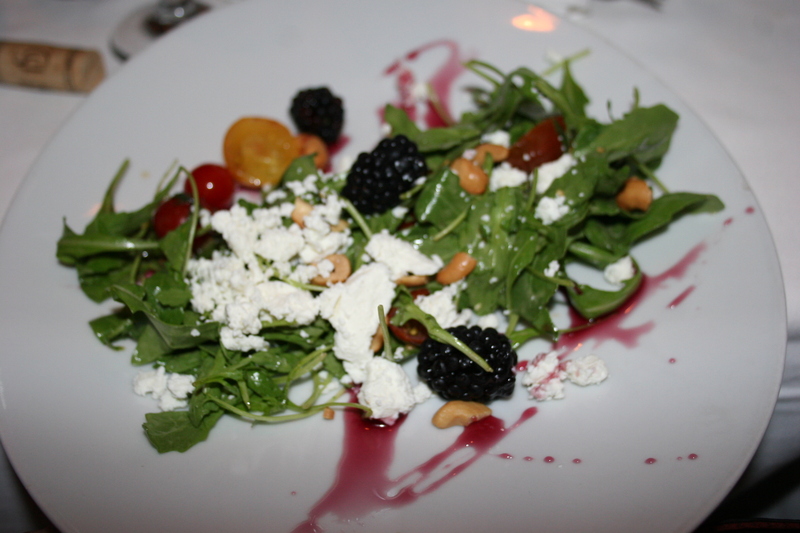 There were some very attractive salad offerings with lots of fresh fruit, the one on the left featuring naval orange slices and the one on the right highlighted by blackberries and fresh goat cheese in a raspberry vinaigrette dressing. The one soup offering that sounded delicious and attracted at least one of our group was the Lobster Bisque w/ corn fritters. It looked excellent, and from the happy murmurings emanating from the recipient, it undoubtedly was just that. 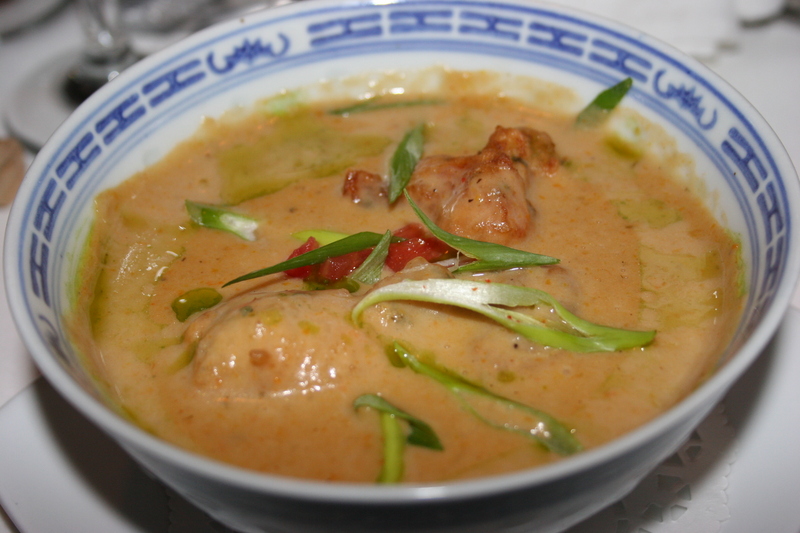 The main dishes were plentiful and included several very tempting offerings from the “specials” list. 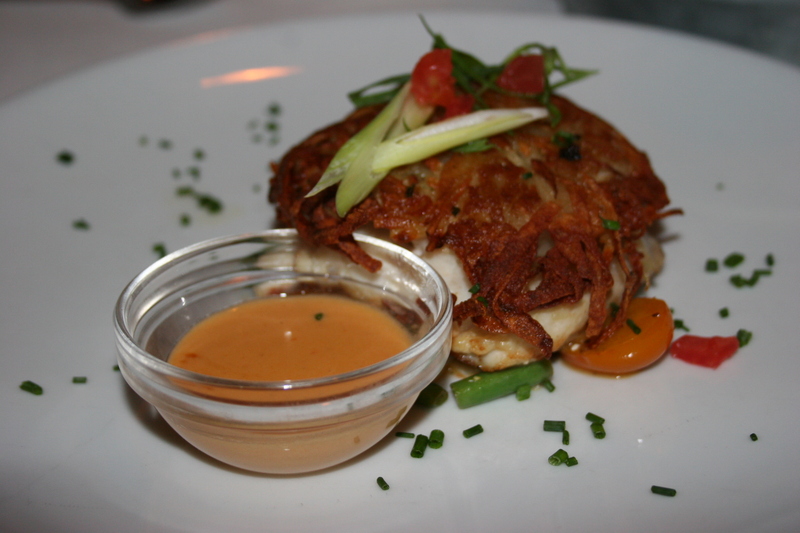 Several in our party chose the Grouper, a flaky white fish that was prepared with a potato crust and served over fresh green beans, jumbo lump crabmeat and came with a lobster butter sauce for dipping. Everyone was pleased with their dish. 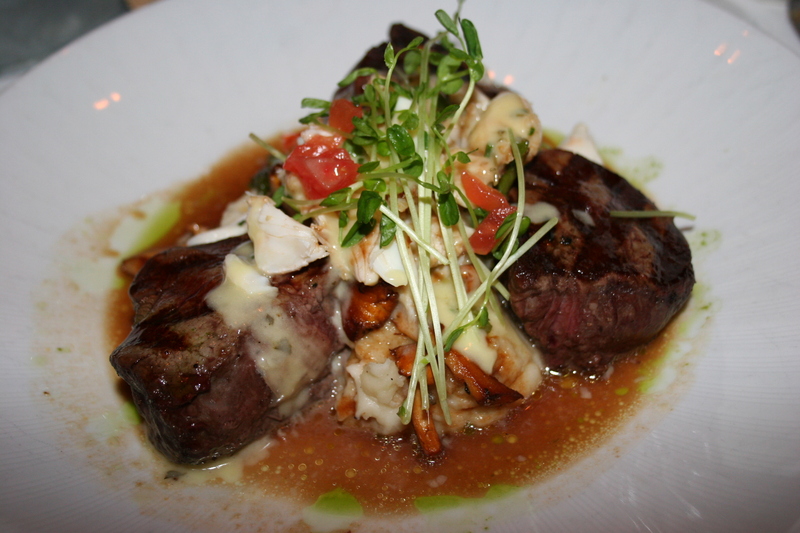 Several others were unable to resist the other “special” which was 3 petite filets served with sauteed mushrooms, asparagus, jumbo lump crab meat and lobster pieces. The filets were enough for two meals, which my wife, Kathy, did and everyone seemed to think the entire dish was tasty and flavorful. 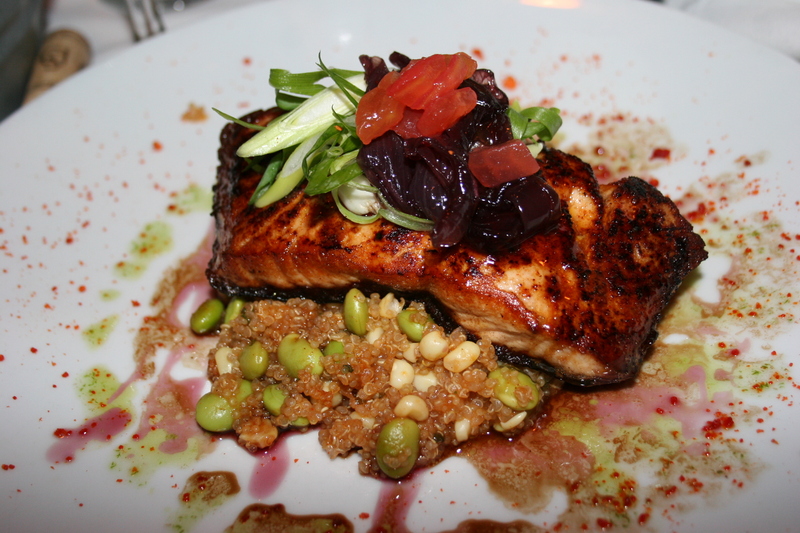 I turned out to be the “Black Duck” in the group (no bad pun intended) when I chose the Salmon as my main course. I may have been influenced by the fact that it was served over a corn and sweet pea risotto but it arrived crisp and perfectly cooked. 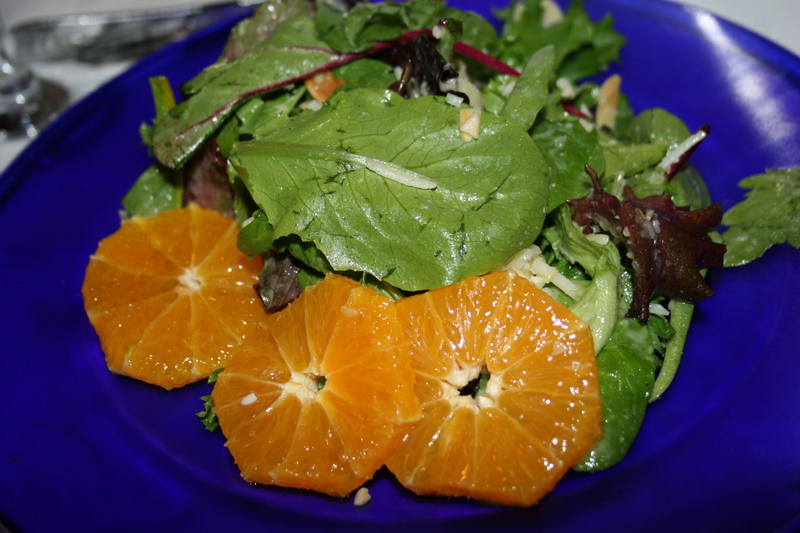 The sauces were just right and added a nice fruity touch to an entree that I was quite pleased with, to say the least. 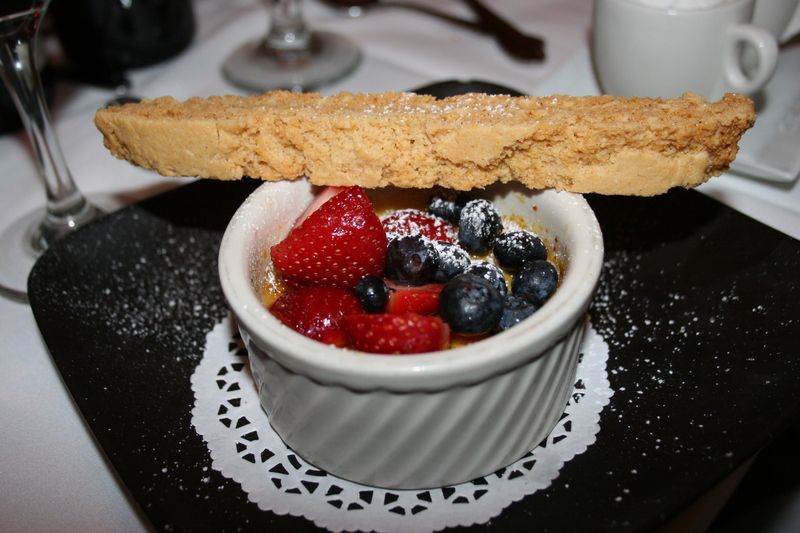 It was hard to believe that we still had room for dessert but we decided to order four and a bunch of spoons and we passed them around, and each of us got to sample some tasty endings to the meal. 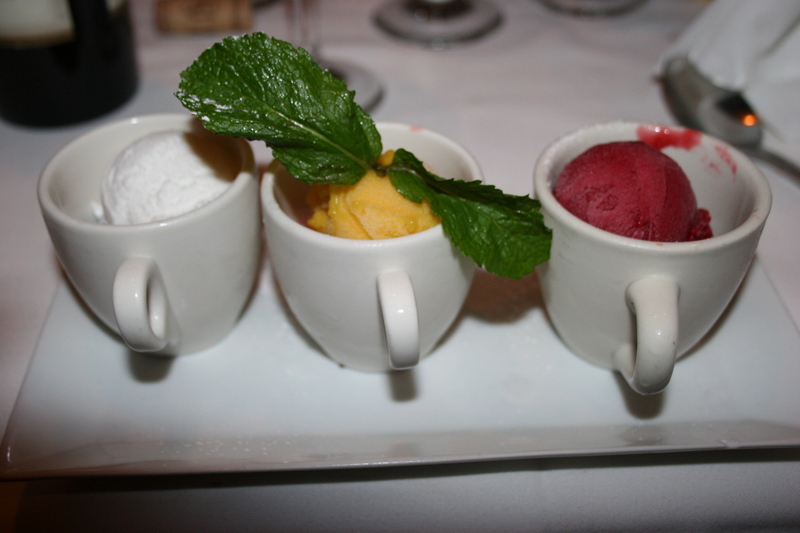 Left to right above are the Creme Brulee, a trio of icy fruit sorbets, and a Blueberry compote with vanilla ice cream. 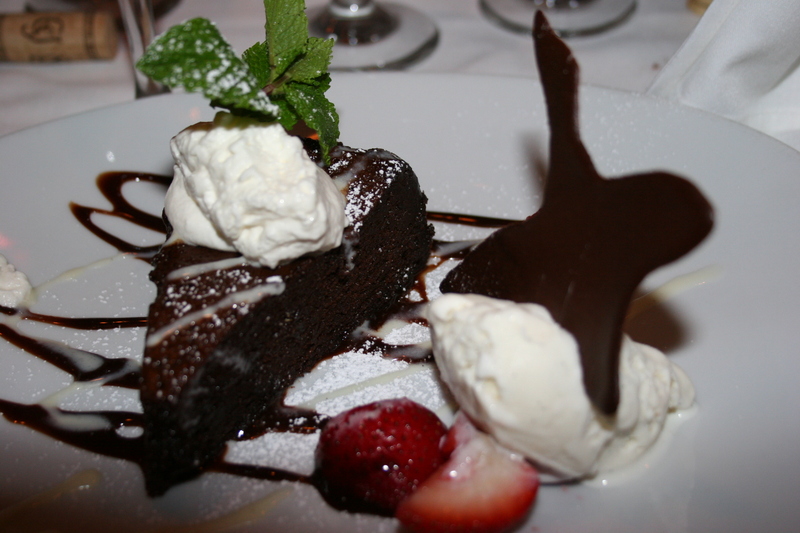 The star of the dessert line-up, as far as I was concerned, was the Black Duck Chocolate Cake which was served with fresh cream on top and some vanilla ice cream with a chocolate “duck” emerging from the frozen concoction. I tried each item once but may have snuck three or four bites of this one. It was awfully good. When we took our leave of The Black Duck it was almost 10:00 P.M. and there were still a considerable number of people milling about outside waiting for a table. I took this as a sign that meant one of two things. 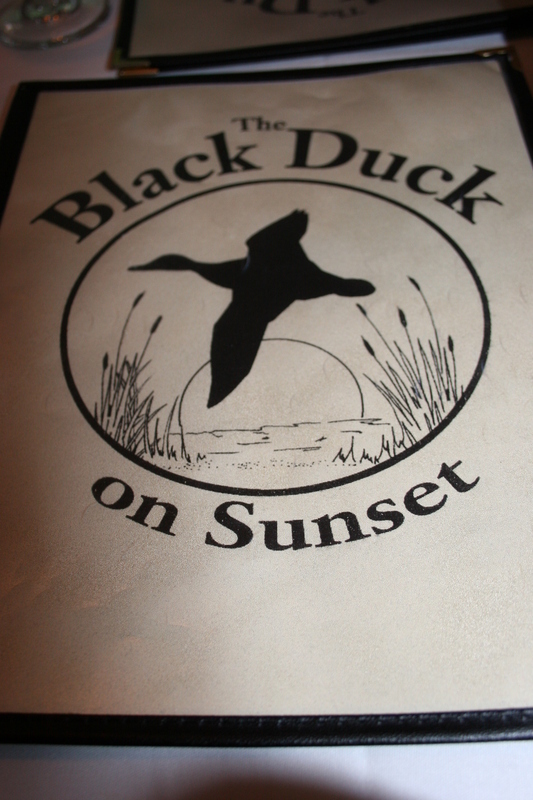 Either The Black Duck was very good, and very popular with locals and tourists, or they were slow at serving meals. 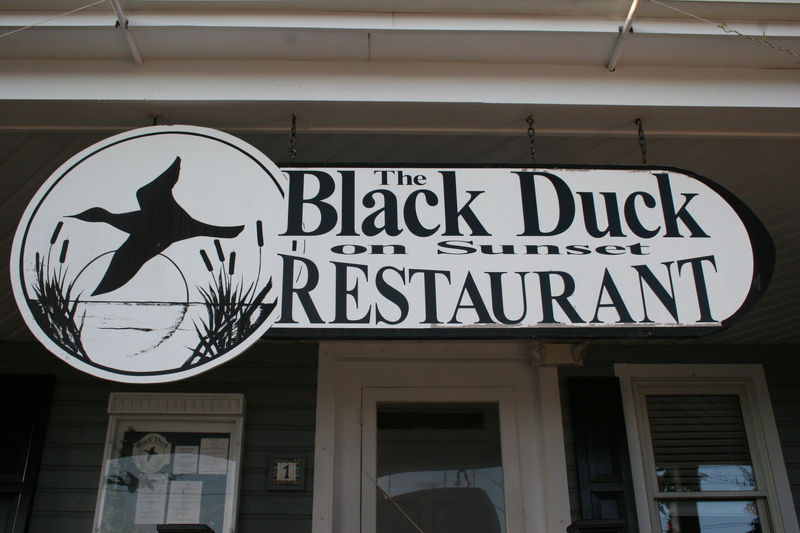 Since I didn’t think that service was slow, I would say that many agreed with our group that The Black Duck serves good food in a welcoming environment.